With my desire to get more organized, I realized I needed a way for more people to print out my recipes. For my full Passover page for crafts, sources, educational and fun links see my full Passover resource page. 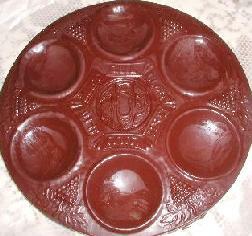 Make Your Own Chocolate Seder Plate in chocolate or for crafts in plaster . These were my Mother's or at least her favorites. She so very rarely ever wrote a recipe down. She used these for years. melt margarine and cocoa and cool. Mom said this is a double recipe. I still doubled this recipe and used large jelly roll pan (size of cookie sheet with a higher rim) made enough for us and presents. Combine crushed matzo/matzo farfel, matzo meal, cinnamon, sesame seeds and nuts in large bowl. Heat oil with vanilla to very warm. Dissolve sugar in water and boil one minute. It's also fine to combine all of the liquids, dissolve the sugar in the liquids, and then boil one minute. Add the hot liquid to the dry ingredients, mix thoroughly, and cook in shallow pans at 200 degrees until dry (about 2 hours). It will dry in clumps, which is just fine. Use like regular granola--also good mixed with plain yogurt and fruit. Stir in raisins and store. Check out my full Passover resource pages. Great for lunches for kids to bring to school. Found a very similiar recipe on a blog with the notation it came from a very old recipe of Manischevitz but used peanut oil. I prefer cottonseed oil because of allergies. I even made some in hot dog roll shape. I have been told to freeze what you wont use in a day or so. Lessons and recipes can be used in classes with © acknowledged. Lessons,recipes and pictures can not be used for commerical use. Passover will not be the same with out her. Pearl was the last of 9 children of Louis and Sarah Smolker. .
As it is not Passover with out Friend Matzie and Matzah with Temptie Cream Cheese often during Passover. Since I do not use a real recipe, here is my attempt to write it down. One egg for each piece of Matzah you are using. I suggest at least 2 pieces of Matzah per person. Lots of butter or margarine as this will stick to pan other wise. Use a teflon coated frying pan or use extra butter. If you can find Kosher for Passover spray margarine spray pan too. Place matzah in a large bowl. Add milk and salt to eggs and beat them to mixed. When margarine or butter is melted, add Matzah/egg mixture. Cook as you would scrambled eggs. Browning slightly. (You have to watch careful not to burn. Add more butter or margarine if you see it sticking.) Flip often to check. So.. how can you tell a modern Jew, Russian Jew, convert etc when eatting fried matzah? Watch what they put on their fried Matzah. In my house, I always ate (before allergies) with sour cream and jam. My boys copy their dad and use huge amounts of pancake syrup. I suggest you read both recipes and you might want to adjust the tips yourself. A traditional Jewish hard long biscotti like cookie. 1/2 to 3/4 cup of coconut. Mom added that you can add some of the cherry juice later if dough is too stiff. Also chocolate chips or raisins can be used instead. She liked chocolate chips with nuts! add oil, cake flour, potatoe starch and mix well. Bake at 350 degrees for 30 minutes or done. Remove from oven slice 1/2 to 1" thick. Add the egs and blend thoroughly. Sift them together and then blend into the oil while alternating add into the lemon juice and zest. Divide the dough into 3 or 4 balls. Shut off oven and cool. This simple dessert is so delicious and easy to make, it sould be considered the eleventh plague. 1. Heat the oven to 400 degreees. Line a cookie sheet with aluminum foil and lay the matzo in a single layer so that it completely covers the bottom of the sheet. 2. In a saucepan, melt the butter and sugar over low heat. Raise the heat and boil the mixture for 3 minutes. 3. Pour the butter and sugar mixture over the matzo and spread it with the back of a spoon. Place the matzo in the oven for 5 minutes. 4. Remove the cookie sheet from the oven and immediately pour the chocolate bits over the matzo. 5. Return the sheet to the oven for 30 seconds to melt the chocolate. Remove the sheet from the oven and smooth the chocolate evenly over the matzo with a spatula. 6. Sprinkle the crushed almonds over the top. Refrigerate for a least 1 hour or overnight. TIP: We've never actually had any left over, but I've heard it keeps for about a week covered in the refrigerator. Use parave stick margarine with parave chocolate chips. Tastes great! I find the matzah does not fit on most of my cookie sheets. Don't worry just break to fit. You are going to break them into pieces anyway. Be careful to boil the sugar carefully not to burn it but long enough so that it thickens some.